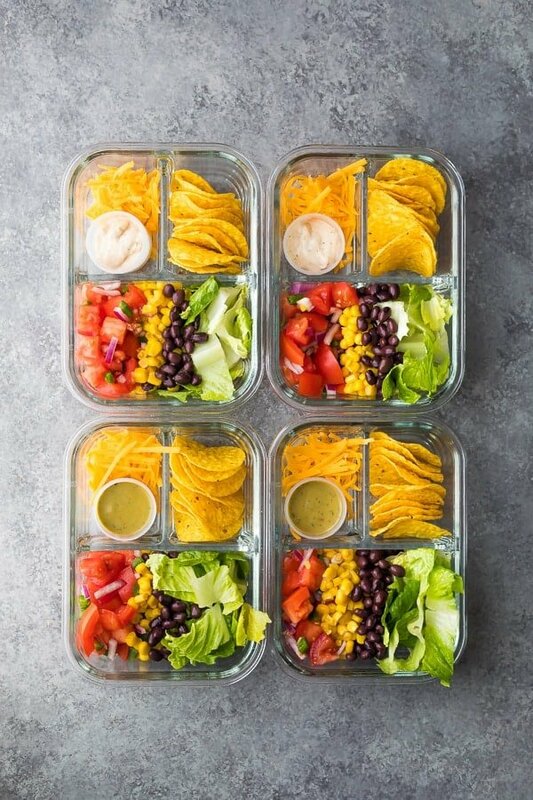 This no cook taco salad bento box recipe is ready for your lunch in under 25 minutes! A great vegetarian meal prep lunch option when you’re too busy to prep. Back with another bento box recipe and I’ve got to say: I’m LOVING them! Check out our Spring Strawberry Bento Lunch Box recipe, too! With my other lunch meal prep recipes, you are going to have to cook stuff. And cooking stuff makes dishes. And who has time to wash dishes when it’s finally starting to warm up?! 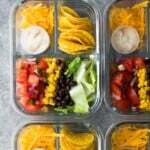 These no cook taco salad bento boxes are ridiculously simple to throw together, and all you’re going to need is a bowl to mix your pico de gallo, a cutting board to chop your lettuce, and a cheese shredder. Not to mention: they are ready in under 25 minutes!!! Where did you get that cool glass bento box? 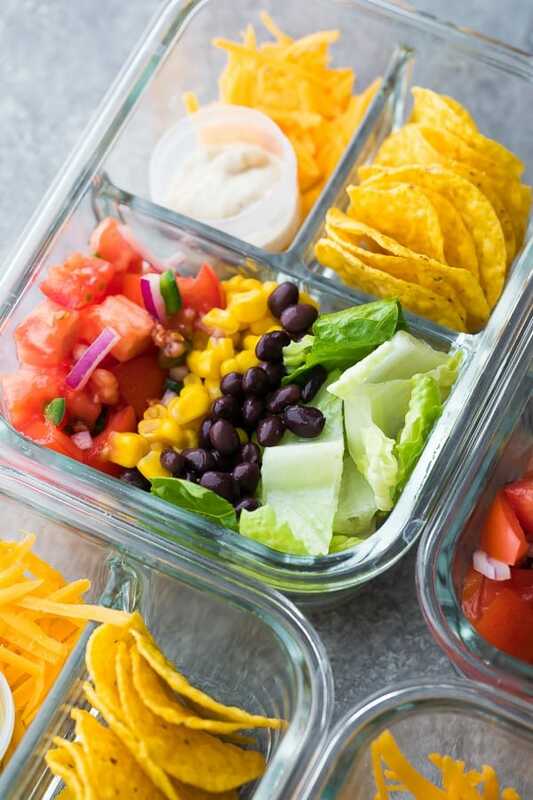 So far we are loving these containers, and the fact that they have separate compartments makes them absolutely perfect for adult bento lunch boxes. I have also used them for this Instant Pot Honey Sesame Chicken Breast and these Thai Salmon Patties. I love that these containers are glass! They are much nicer to eat out of than my old plastic bento containers. However, be warned that they are heavier, and also, they do take up some extra space in the dishwasher. This is really a loosey goosey recipe. You can swap with what you have in the fridge…’clean out the fridge’ meal preps are my favorites!! You could totally swap out the black beans for some cooked taco meat…that would be perfect in this recipe! You could also add in some rice or quinoa to make it more filling. So. That’s it! 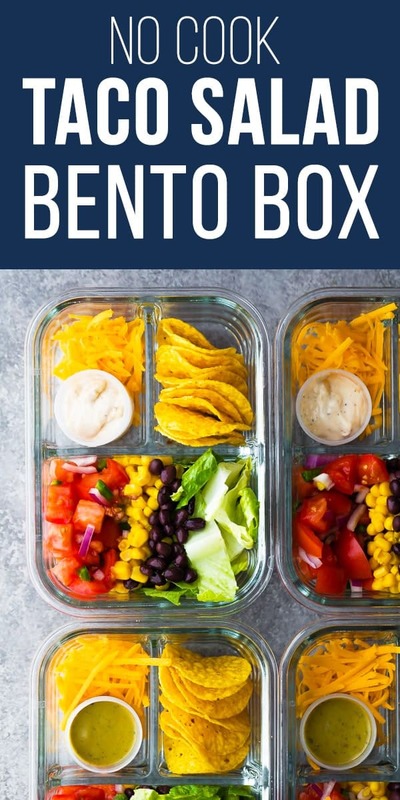 I have more bento box ‘recipes’ planned out over the next few months, and we may even do a bento box lunch prep challenge, so I hope you are enjoying them! , they are perfect for adult bento boxes! Keep the romaine separate from the pico de gallo to keep it as fresh as possible. 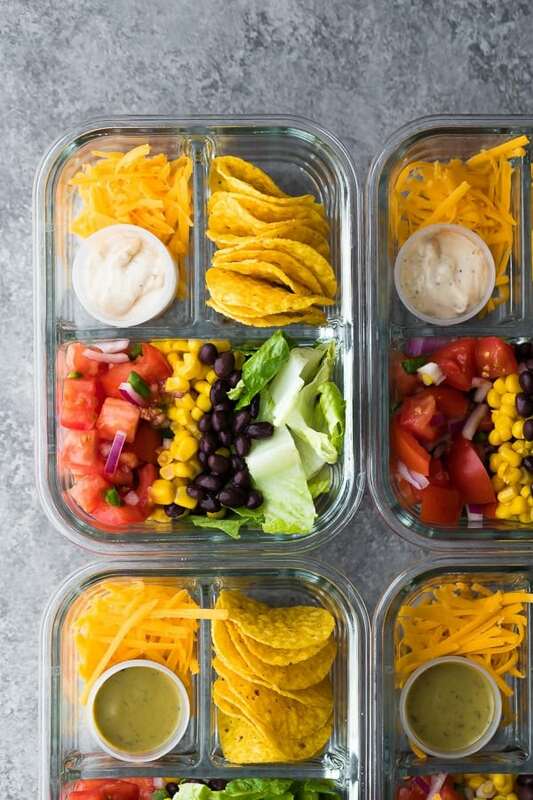 This no cook taco salad bento box recipe is ready for your lunch in under 20 minutes! A great meal prep lunch option when you're too busy to prep. Divide ingredients into four storage containers. Use a condiment container to keep dressing separate until just prior to serving. Stir together the pico de gallo ingredients and add to the containers (make sure the pico is not touching the romaine). Store in the fridge for up to 4 days. You may wish to bring an extra bowl to serve the salad in.